Italmas, a one-of-a-kind build underway at Van Dam Custom Boats, in Boyne City, Michigan, is a world-class cruising vessel designed by Stephens Waring Yacht Design. She has been shaped and appointed for her owner to easily enjoy daysailing as well as cruising on the Great Lakes. Distinction and grace have been combined in a traditional manner and squarely pay homage to yachts of the ‘40s and ‘50s. The yacht exudes classic. Sail Area: 1,072 sq. ft.
She is largely constructed of hand-selected mahogany, carefully sorted and chosen for characteristics that will best suit each construction application. Ben Van Dam, the president of Van Dam Custom Boats, together with his seasoned craftsmen, ensure there is a solid plan in place for success. Their onsite, four-year apprentice program is shaping future boat builders and all are well instructed before the sawdust flies. Amazingly, as it has always been, planes and chisels are still at the top of the list when the crew reaches for the tools of the trade. Traditional design styling of the past meets old-world craftsmanship. A marriage made of timelessness. Let us be clear however that Italmas does not lack for modern innovation. At Van Dam, old and new have learned to coexist very, very well. Italmas’s cabin top planking epoxied into place. She’ll crush the competition to windward. 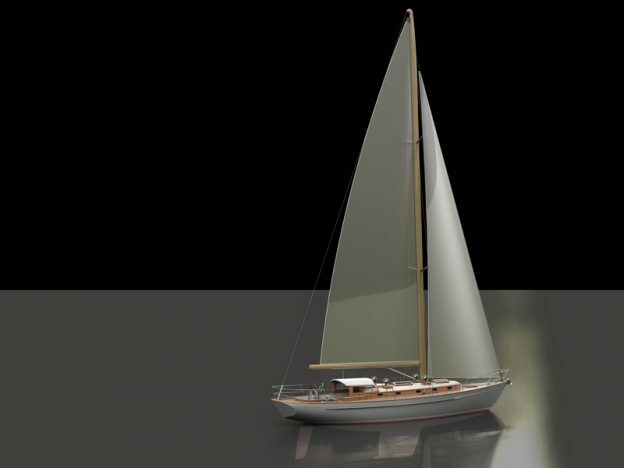 She sports a super-efficient keel and rudder with a modern, low-wetted surface hull. She was engineered to be strong and light. The Van Dam skill with wood will ensure this is the outcome. Idiot-proof water ballasting: Italmas was so light that we found a ton of spare space between the lead at the bottom of the bulb keel and the bottom of the hull. So much so, that we could engineer a 60-gallon fuel tank right there in the keel. Italmas will feature an everyman’s water-ballasting option: Rough day? Top off the fuel tank for more windward punch. Want to strip down for lighter days? Run the tank closer to empty. She’ll move right along. Custom cabinets going into Italmas’s galley. She’ll be roomier below: Italmas will be open and airy with large forward spaces and plenty of room for guests and gear. A fair amount of privacy ensures a week at sea will not leave people wishing for alone time. 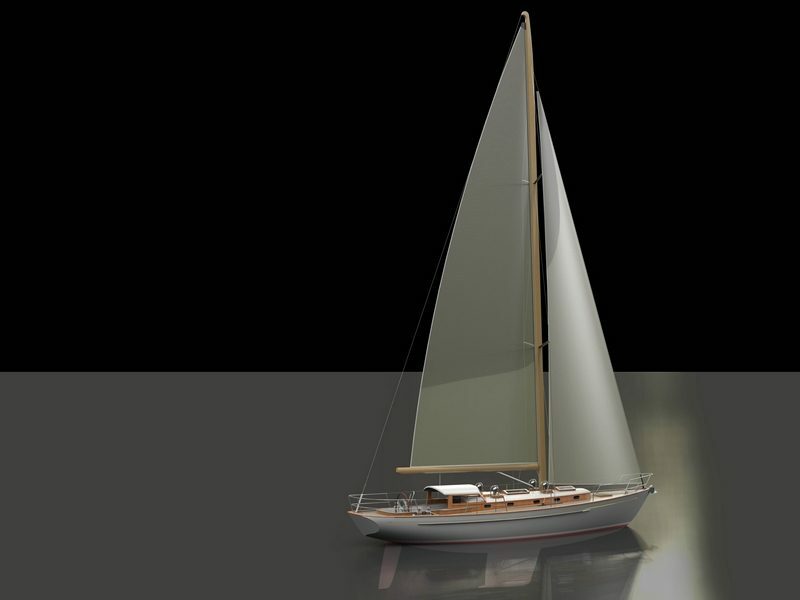 She’ll be easy to sail: Italmas will be lighter, stiffer, and roomier than you would expect. Consequently, we paired her with a custom engineered, modern wood spar that utilizes advanced materials where appropriate. Her taller rig and lighter overall weight will provide enough sailing horsepower for some serious “get up and go” when the seas will allow it. At Van Dam, Italmas will be shaped using the process of cold molding. Room-temperature cured epoxy adhesive is used to laminate many thin layers of wood creating the large structural members of the hull, as well as the hull itself. Taking advantage of the benefits of epoxy adhesives and the natural strength of wood, the crew at Van Dam meticulously forms and assembles all the structural members, joints and skins to create a wooden boat that is strong, durable, and stable. 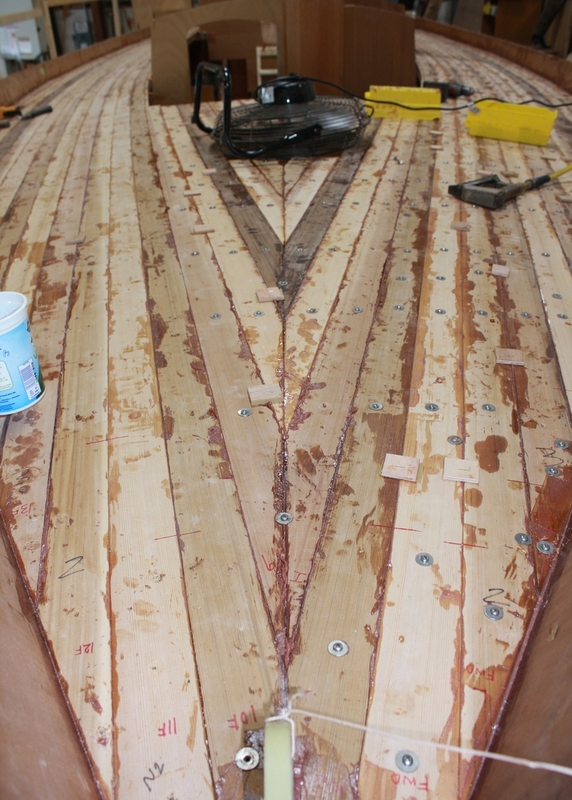 The boats are not built as they were before epoxies and then epoxy is simply added. That wouldn’t be an effective use of epoxy, and can result in myriad future problems–and an unsatisfied customer. When done well, custom wooden boats are by nature a unique level of luxury as compared to similar watercraft constructed from production fiberglass. 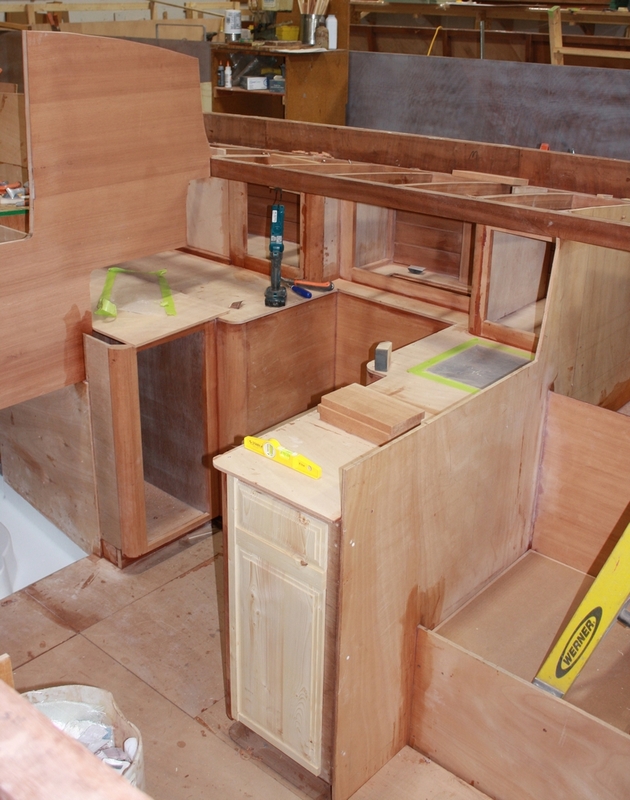 Furthermore, the cold-molded process of wooden boat building, as done by the craftsmen of Van Dam Custom Boats, affords clients a lightweight, resilient vessel impervious to the traditional challenges of water meeting wood; swelling, cracking and rot are non-existent in these builds as long as the boat is properly cared for. Van Dam’s lifetime guarantee supports that fact. Italmas will be more seaworthy in foreboding weather, a quicker sail to her destination—home or open water—and easier to captain than most any other boat of comparable appearance and styling. Stephens Waring Yacht Design put forth the dream. 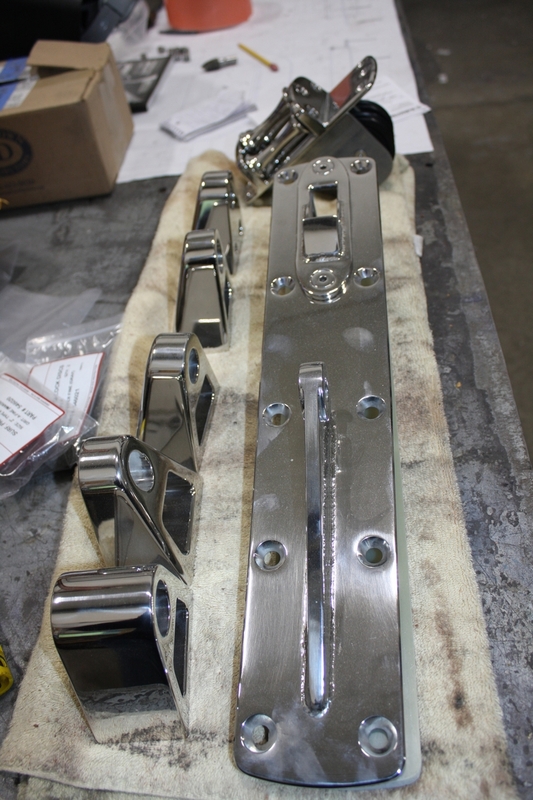 Van Dam Custom Boats is bringing that dream to life. 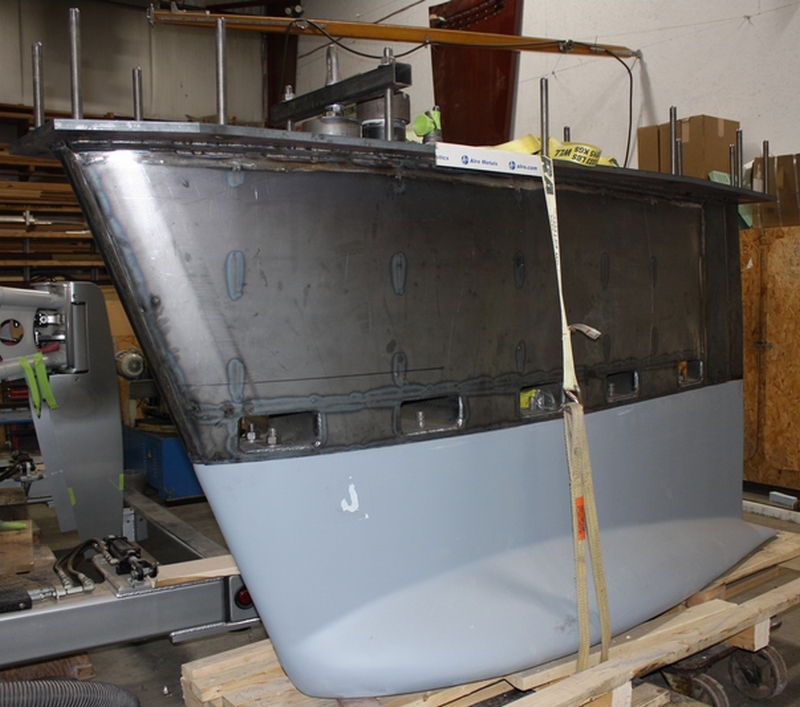 The 60-gallon fuel tank mounted on top of Italmas’s bulb keel.